The expressive and colourful paintings of the Austrian artist Oskar Kokoschka (1886-1980) are not just the subject of the major autumn exhibition in Museum Boijmans Van Beuningen. The museum and PAN Amsterdam are creating a contextual link between the exhibition in Rotterdam and the art fair in Amsterdam. The exhibition’s guest curator, Beatrice von Bormann, is compiling a tour for PAN Amsterdam (24 November – 1 December) that focuses on the versatility of Kokoschka’s oeuvre. Along this route, art historian Beatrice von Bormann explains the different disciplines that Kokoschka mastered and used in his work. The tour she is designing at PAN Amsterdam covers paintings and decorative art objects that are for sale at the fair – from old masters to contemporary artists. 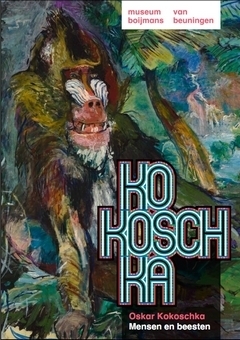 Von Bormann explains the link between each of the chosen objects and Kokoschka’s work. A map of the route will be available at the entrance to PAN Amsterdam in the RAI exhibition centre. The tour puts Kokoschka’s oeuvre in a broader art historical context as a result of the links with other works at the fair. Oskar Kokoschka is best known for his painted portraits and townscapes, but he also designed picture postcards, dust jackets, theatre posters and a number of fans for the Wiener Werkstätte (the Austrian version of the British Arts and Crafts movement). He also wrote plays, designed stage sets and made countless drawings, watercolours and lithographs on the most diverse subjects throughout his life. The cooperation between Museum Boijmans Van Beuningen and PAN Amsterdam is a continuation of the successful collaboration during ‘The Road to Van Eyck’ – the exhibition in the autumn of 2012. On that occasion Friso Lammertse, curator of old master paintings and sculpture at the museum, compiled a ‘The Road After Van Eyck’ tour. He put it together on the basis of the works of art at the fair in which he recognized Van Eyck’s influence. This was the first ever example of such cooperation between a museum and an art fair. When the exhibition opens on 21 September, a hundred and fifty of Oskar Kokoschka’s paintings and drawings will be on display in Museum Boijmans Van Beuningen. Masterpieces have been lent by private collectors and such internationally renowned museums as MoMA in New York, Neue Nationalgalerie in Berlin and Tate Modern in London. Against a backdrop of eight themes, the exhibition sketches a personal perspective of the painter during the period around the First and Second World Wars.